On Sunday, December 11, Silent Barn is hosting a benefit festival featuring bands and poets in support of the Dakota Access Pipeline protesters at Standing Rock in North Dakota. Stand With Standing Rock: A No DAPL Benefit Festival will begin at 7 p.m., and entry is on an $8-$20 sliding scale throughout the night. Featured artists include Bunny Michael (self described "Interdisciplinary artist channeling higher consciousness to be a conduit for peace in the world"), New Brunswick rockers Professor Caveman, local experimental musician and White Mountain Apache Laura Ortman, Esoteric Ayanna and Benjamin Lundberg. All proceeds from the show go directly to Standing Rock Medic & Healer Council, described by Silent Barn organizers as "a collaborative effort of volunteer medics, physicians, and other healers available to the water protectors in the face of police brutality." The benefit festival takes place not long after a group of over 2,000 veterans vowed to create a human shield to protect protestors of the pipeline project, and the announcement of a December 5th deadline for the protestors to relocate by the Army Corps of Engineers. 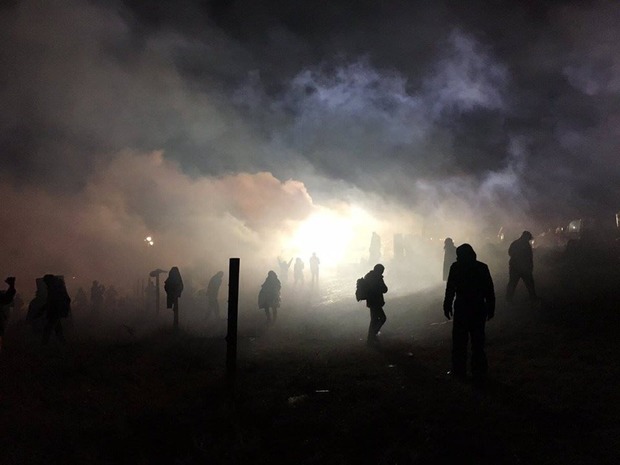 The Corps has since clarified that it "has no plans for forcible removal" of the water protectors. Regardless, the protestors have vowed to stay put, and as winter sets in, the need for support and supplies has never been greater. More info and tickets can be found here. If you can't make it out to the show, please check out some other ways to support the cause here and here (in the latter link, the photos from Standing Rock are the work of Bushwick Daily photo editor Alonzo Maciel). Keep fighting the good fight, Bushwick. Featured image: protestors at Standing Rock. Photo courtesy of Silent Barn.